Reform Judaism has long dominated Jewish religious life in the South. And yet, groups of Orthodox Jews have held to their traditions and cut their own path of adjustment to life in the South. Congregation Ahavath Rayim of Greenwood, Mississippi, was one of those rare pockets of small town Orthodox Judaism. Although the congregation is no longer Orthodox, Ahavath Ravim's members remain dedicated to preserving worship there for as long as possible. Although some Jews held orthodox services in their private homes as early as 1891, Congregation Ahavath Rayim was officially founded in 1907. The founding members were A. Davidson, Aaron Orlansky, H. Schlesinger, M. Diamond, Simon Davidson, Joe Schweig, Louis Carron, Ike Gelman, Edgar Schweig, Joe Podbersky, Aaron Arenson, Morris Miller, Louis Blumenthal, Ben Garlove, Morris Weisberger, and Carnie Seigel. All but one of these men were immigrants; most came from Russia after 1900. These individuals were typically young men with young families who worked the common immigrant trades of dry goods, shoes, general stores, or groceries. While most had been in the United States for only a few years, these immigrants still found the time and the effort to continue the customs of their past. They adhered to the orthodox belief that strict observance of ritual prayer sanctifies the routine of daily life by serving as a constant reminder of the divine presence. For the most part, they did not seek to participate in activities of the Christian community, except to send their children to public schools. 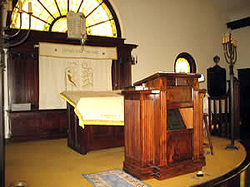 From its foundation until the 1920s, members of Ahavath Rayim held services in the Masonic Hall. With an official charter granted on June 11, 1917, and temporary affiliation with the Orthodox Union, the synagogue grew to the point of needing a new building. By 1922, Ahavath Rayim built a new house of worship at the corner of George and Market streets. The shul was built in the traditional style with a raised bemah in the middle of the sanctuary. The members dedicated this brick structure in January of 1923. Unlike the Reform Temple Beth Israel in Greenwood, Ahavath Rayim featured leadership from a resident rabbi throughout much of its history. Most of these rabbis were short-lived. Their names included Maisil, Zissman, Harding, Sussman, Danziger, Kaplan, Marks, Seihel, Atlas, Strauss, and Stone. Rabbi David Schapperstein was the congregation’s first spiritual leader, serving from 1914 to 1923. In its early history, the rabbi’s job at the synagogue was not focused primarily on teaching children or leading services; members were knowledgeable enough that they could handle these day-to-day duties of the synagogue. Rabbis came for the primary purpose of dietary needs, meaning they were in charge of the kosher meat as well as keeping kitchens pure for the use of strict orthodox families. While the early rabbis took care of dietary procedures, members of Ahavath Rayim provided multiple educational opportunities. For young adults, members held weekly Torah classes in private homes. For the younger children, there was Hebrew school also known to some as Cheder. Rabbi Silver of New Orleans originally ran the supplementary school, visiting monthly for an assembly program, while also developing curriculum and working with the teachers. While this educational program tailored to the needs of some, particularly those boys needing a bar mitzvah, many families also sent their children to the Reform Temple Beth Israel. Despite their religious differences, the two synagogues shared some members, while many youth group events and educational opportunities were open to all Jews of Greenwood. While the groups did mix to some extent, discussions about merging the two synagogues were never fruitful due to differing religious philosophies. Unlike its Reform counterpart, Ahavath Rayim usually had a relatively large membership base. Many Jews came from neighboring towns including Belzoni, Winona, Grenada, Greenville, and Indianola to worship at the synagogue. By 1940, the congregation under the direction of Rabbi Phillip Danziger had a membership of 35 families. After a period that included the Great Depression and World War II, the needs of the Greenwood Orthodox community changed, calling for the need of a more traditional, pulpit-leading rabbi. Despite changes in the economy, Rabbi Samuel Stone came to fill this niche, and the congregation grew to over two hundred total members by the end of the 1950s. In 1951, the congregation renovated and expanded its synagogue, adding a modern kosher kitchen as well as a new auditorium and religious school building. At the time, the synagogue was home to three Torahs. While one was a synagogue purchase, the other two were gifts, including a European scroll from the Kantor family and the other bought in honor of the wedding of Mr. and Mrs. Ike Gelman, major contributors to the congregation. While many men served the congregation, Ahavath Rayim would not have survived if it had not been for the work of its women. Although a Ladies’ Aid Society existed as early as 1908, 1951 marked the birth of the Synagogue Auxiliary, a group that took upon itself many initiatives ranging from raising money to organizing holiday celebrations. Women also assisted the rabbi in hiring teachers as well as in maintaining the synagogue cemetery, found today on Bowie Lane. During the 1950s, Jewish life at Ahavath Rayim was quite strong. While institutional changes brought new members to the Orthodox community, the Greenwood Jewish community could not withstand the changing demographics and economics throughout the latter parts of the twentieth century. As Greenwood began to rely less on cotton and more on other industries such as the Viking Range Corporation, younger Jews left Greenwood for the big city. Despite these challenges, Ahavath Rayim continued to practice its traditional Judaism. By the 1970s, life at Ahavath Rayim changed, but worship still continued. While they no longer had a rabbi, the community still had services every Friday night and during high holidays. Although membership was still around sixty-five individuals, Sunday school attendance had declined to only five students. 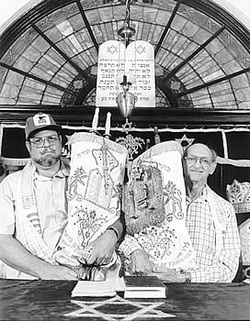 This dynamic soon attracted the attention of Memphis’s Rabbi Benjamin Wolmark, a religious man who started coming twice a month to teach Sunday school as well as perform any necessary ritual ceremonies in 1976. Despite decreasing membership, life continued at Ahavath Rayim throughout the 1980s. While Temple Beth Israel dissolved during this period, leadership under such men as President Leslie Kornfield and Joe Martin Erber allowed worship to occur as it had for many decades. While a few new people did arrive, Greenwood’s Jewish community could not replenish itself as it had in previous decades. As a result, the synagogue had to change in order to survive and maintain the Jewish faith in Greenwood. Their small membership caused Ahavath Rayim to perform traditional Hebrew services with mixed seating because gender separation was not feasible with such a small crowd. The Ahavath Rayim synagogue once filled itself to capacity during the high holidays, with people coming from small towns throughout the Delta. Today, life has changed. Services continue to this day, but Orthodox life is not as it once had been. With no Mikvah since 1950 and mixed seating, Orthodox Judaism in Greenwood has evolved to fit its changing environment. Current members of Ahavath Rayim talk about being the last ones to “close the gate,” but they hope that this will be in the distant future.